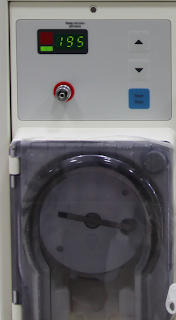 One of the most important factors in the quality of your dialysis is the dialysis pump speed. This is the speed at which the dialysis machine draws blood from your arterial line, puts it through the dialyzer or the artificial kidney and then returns it to your body through the venous line. The higher the blood pump speed, the better your blood gets cleaned by the artificial kidney. This is mainly because with higher pump speeds, more blood gets drawn and put through the artificial kidney which allows the artificial kidney to remove more and more toxins from the blood. This is a picture of the blood pump from a Fresenius 4008S machine and the number '195' in the picture is the pump speed. So, as someone on dialysis, it is in our interest to have the highest blood pump speed that our body and vascular access can tolerate and is required. Note that this is true only for people on conventional in-center dialysis who come twice or thrice a week. For those on daily dialysis, the pump speed can be lower to give a more gentle dialysis. Many people complain that they do not feel 'good enough' on dialysis. This could be because they are not getting enough clearance or not enough toxins are being removed by dialysis. Ideally of course, the frequency of dialysis or the duration of the session must be increased. But if that is not possible, the next best alternative is to increase the blood pump speed. This will result in increased clearance and the person feels better. Technicians and nurses sometimes do not risk high blood pump speeds because it can lead to some complications. However, they should gun for the highest pump speeds that the patient can tolerate. The pump speed must be gradually increased and if the patient does not complain of any problems and good flows are obtained (no air bubbles appear in the arterial line), then the pump speed is all right. A word of caution though: every change in pump speed must be signed off by your nephrologist as every individual is different and may have different conditions (especially cardiac related) which may necessitate a different line of action. But this is something definitely worth considering and talking about with your nephrologist and your technician or nurse. If pump rate exceeds arterial blood flow rate within access then excessively high pump rate can cause recirculation and processing blood from venous end of access. I agree (with Anonymous); I myself am forced to stay with 250 ml/min because of a functional stenosis in my shunt (yeah, I will eventually run into trouble with this shunt--this shunt was the third attempt in the last two years). I plan to start home dialysis soon, and hope to stay with this value. I feel quite sick when the speed exceeds 280 ml/min. I get a bad headache. Yes, every individual is different. While some people do have a problem with high pump speeds, I see, at least in India, many people are unnecessarily being dialyzed at low pump speeds. And they can come only twice or thrice a week. My post was targeted to these people. They are regularly run at 250 ml/min whereas they can easily tolerate 300 - 350 ml/min. Best to stick to some "standards", rather than let a Technician do his own thing, much like an Auto driver deciding how fast he can go on a particular road. These standards can be established by a bunch of experts in hospital situations and the manufacturer of the equipment. I would hesitate to give too much discretion to a Techie. Kamal's post can be treated as a point for Nephros and Manufacturers to discuss on the recommended settings and speeds. Kamal! I may sound stupid but still i have this doubt. See, with what ever speed blood enters the dialyzer, it will have to find its way out only after the toxins are cleaned right? Then how is it that tolerable high speeds are recommended? If my understanding is right, the machine may draw low quantity of blood or high quantity of blood per second(lets say this way), but still it will have to do its job of recirculating whole quantity of blood for cleaning the toxins. And the dialisis will last till the whole blood is cleaned up. My question is to just understand this better. Vinod, there is already an effort underway that attempts to standardize this and many other aspects of dialysis treatments. Thrinath, the way it works is - the blood is continuously pumped out from the body and passed through the artificial kidney. In one pass, however much can be removed is removed and the blood is pumped back into the body. The toxins are not all removed in one pass. The greater the number of passes, the better the toxin removal. And the number of passes totally depends on the pump speed. And btw, no doubt is ever stupid Thrinath! I appreciate your attempt at trying to understand this better! My husband speed is between 100 to 150 most of time , only once did it reach 170. That is a low pump speed. What is his access? Are other patients in his centre also dialysing at similar pump speeds or is it only your husband? Yesterday i have horrible experience with pump speed. I requested Technician to change pump speed upt o 350 but he changed to 435. after 5 minutes there is shok like experience in my heart. Immediately informed to technician what happened. He told your pump speed is 435. i shouted and why you have increased and he reduced to 330. this is my first time experience. is it for high pump speed and is there any effect in future on my heart. Oh! Increases to pump speed should be done gradually especially if they are being done at high values. You should check with your nephrologist about any possible effect on your heart. I dialysis 3x a week. Already 4 yrs on dialysis. Blood pump 400. But i adjust myself if got problem. Nipro japan a good machine. I have found after one year on dialysis that the pump Speed is very important to how I feel.I was getting very serious headaches at 400 pump speed.Some lasted 2 days.Started asking the nurse to lower the pump speed and I found the headaches were going away.I got the nurse to lower it to 340 and the headaches stopped.Im in the process of lowering it some more as Long as the blood tests look good after dialysis,I will keep lowering it to 300.Its way easier on your body after a dialysis session when pump speed is lower.